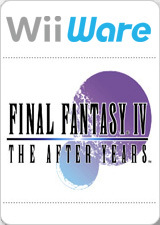 Final Fantasy IV: The After Years is a WiiWare game. The story takes place many years after the original and centers on a young man named Ceodore, son of the paladin Cecil and the white mage Rosa, who, along with their loyal and steadfast friends, once saved the world from evil born of the second moon. Now, monsters are reappearing in a world that had finally attained peace. The second moon has returned anew. What tidings does this ominous harbinger bring? Familiar faces and new allies join the battle to save the Blue Planet once more. Dolphin's save states don't work properly, use in game saves. The graph below charts the compatibility with Final Fantasy IV: The After Years since Dolphin's 2.0 release, listing revisions only where a compatibility change occurred. r6340 Windows XP AMD Athlon II x2 215 @ 3.45GHz NVIDIA GeForce 7025 658MHz Game completed. All time runs at 100% of speed. If use speedup button (TAB) - get up to 133-166% of speed, but sadly in most place you'll get only 105% of speed (no speed up). Some bugs with disconnected Wii Remote and sometimes some layers of gfx become black, also Save States don't work - used in game save function. †.fl.l). 4.0-1759 Windows 8 Intel Celeron N2810 @ 2.3GHz Intel Graphics HD 30-35FPS at Native. Battles are at near 100% speed (but sometimes drops to 45FPS). OpenGL is a few FPS faster than DirectX.